Here at the Solid Wood Flooring Company, we normally use Bona Naturale Industrial Lacquer with a gloss level of no more than 10% so that the board is completely sealed and has a matte finish. We can also apply the Bona ANTI Slip lacquer as well to meet the latest health and safety requirements in commercial applications. We apply nine coats of the Bona Industrial finish from special base coats to seal the wood to the protective top coat. We do not use Aluminium Oxide which a lot of manufactures use and the problem with this is that it can scratch leaving a white mark. 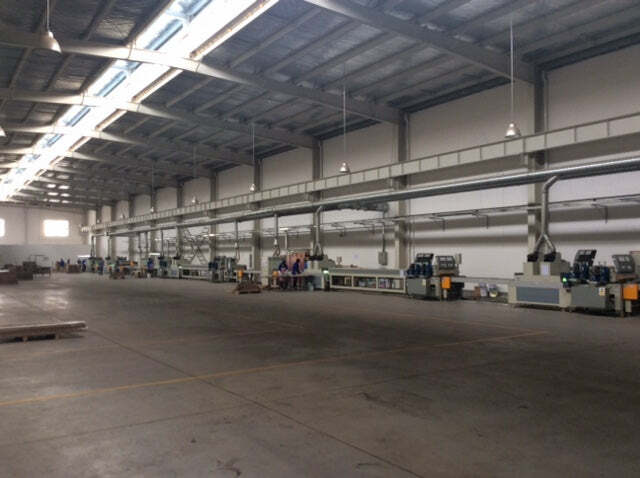 The production process is very efficient with the nine stations using rollers to apply the various coats and heat chambers and UV lights to cure, so that the boards can be inspected at the end of the line and packed in sealed cartons. The picture above shows the length of the line and the individual stations where the application of the various coats is applied by rollers set to exact tolerance to ensure the correct amount is applied for each coat.